The main purpose of Pumpic App is to help parents be aware of their kids’ online activities, thus preventing them from dangers on the Internet and in the real world. With Pumpic it is possible to view calls and SMS, chats, track location, follow online activity including browsing history etc. The app is compatible with iOS and Android platforms and with almost all smartphones and tablets. Pumpic parental control application offers an impressive list of features both for iOS and Android platforms. Pumpic is considered to be the best parental control app for iPhone, since it provides remote monitoring of child’s device without installing the app. After you’ve gone through the sign-up process, you’ll receive the mail with your account details and the password. Use them to log into the Control Panel. To start monitoring, first choose the platform of the device you’d like to monitor. To assign an iOS device, enter the Apple ID and Password and make sure there is enough space to save backups. This is the place where all information is displayed. You may access it through the web browser or use the iOS Control Panel or Android Control Panel app installed on your phone. Mind though, that the app version shows less information than the website. In comparison with other control panels of parental monitoring apps, Pumpic’s is more intuitive and informative, all information is easily accessible. It is possible to set the search item: for example, you can scan the information for the certain website, location or calls from certain contact. 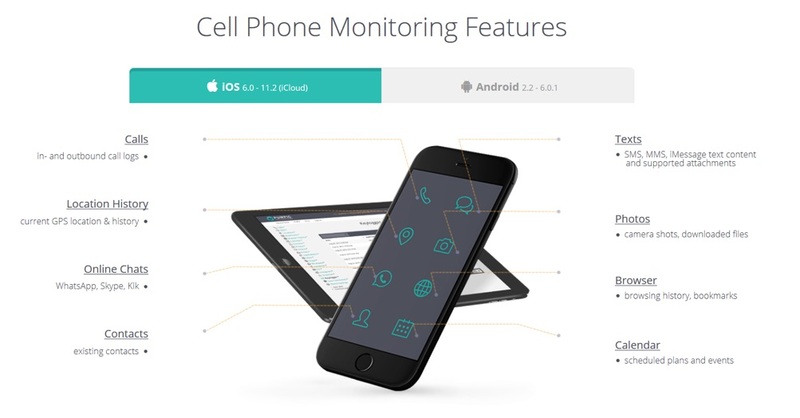 One of the most useful features out there – monitoring of SMS and iMessages. It gives a possibility to check the contents of messages and sort them according to the date. iCloud version allows users to look through the deleted messages – those that were backed up to iCloud. In case if the message was deleted before the backup, then you won’t be able to get access to it. As for the Android, Pumpic will show deleted messages if they were deleted in more than 5 minutes after the time of delivery/sending. To see, whether your kid deletes messages, check the status column in the Messages board on the Control Panel. If you see “Deleted” there, that means that your children delete sent or received messages hoping that no one would see them. Pumpic cost is quite affordable, as monthly fee starts from $14.55/month for 6-month iCloud subscription and $7.33/month for 6-month Android Basic subscription. Pumpic is a multi-featured tool for parents who pay attention to their children’s online activities. To have a better understanding visit Pumpic Demo page. Mind, though, that no matter how great and productive your parental control app is, it cannot replace you. Consider it as your helper in the process of upbringing responsible online citizens.